Here’s the advice: when using half-square triangles as your border blocks, try them multiple ways before choosing. Why? Because setting them with different line and value orientation changes the appearance significantly. It’s worth taking the few minutes to audition variations. This simple illustration gives 4 different ways to arrange them. Here are some examples from a little quilt I made in 2014. They aren’t sewn together yet, hence the wonky look on some of the pictures. There are still other ways to try these, too. Other than the first one, they all have the dark value close to the center. Try them with the light side against the center for a different look. Also, they aren’t shown with changing orientation, similar to the right side of the illustration at the top of the page. In other words, there are at least eight ways to use them, and that assumes that you pattern them the same on all four sides. Here are some examples from my quilts. First, Marquetry. Note that two of the borders use HST, but with different arrangement. Another one is Bird On Point. Closest to the center, the HST run around in one direction. In the middle blue-and-blue border, they’re positioned differently to create movement in the other direction. And one more, Black Sheep Manor. This also has HST in two borders. In the one around the center block, the triangles “spray” outward symmetrically. In the middle border, they have changing orientation for value and line. 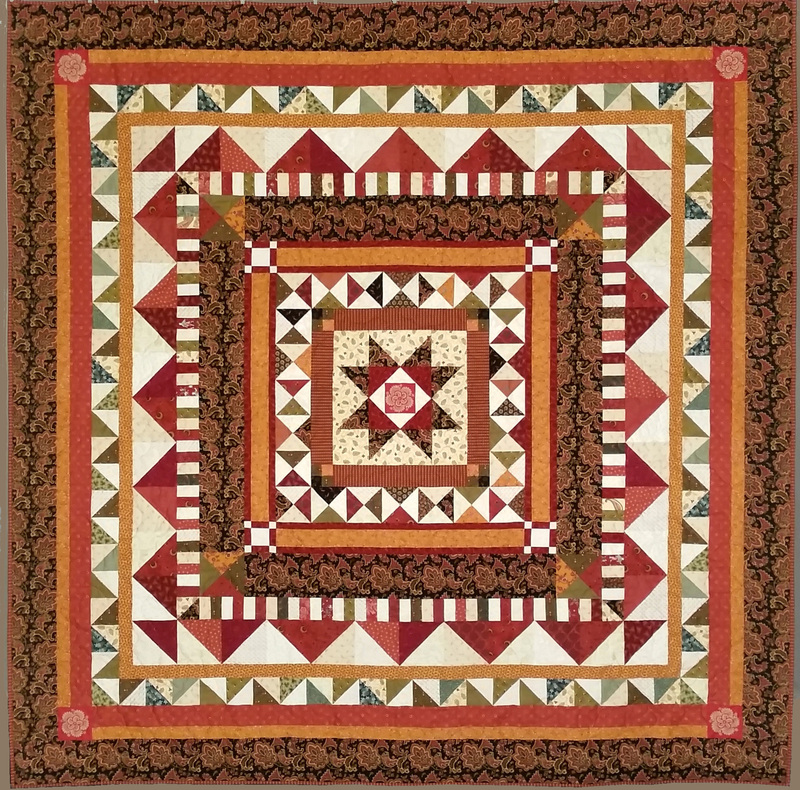 This entry was posted in Medallion Lessons, Medallion Quilts, Quilting and tagged Borders, Half square triangles, HST, Quilt borders, Shape, Tips on November 17, 2017 by Melanie McNeil. Here are a few pix. Below is the finished top in as big of a view as I can manage. There are a few “Christmas” fabrics in it, but I rarely buy novelty fabrics. My friend Sharon passed a few of hers to me, so bits of hers show up. Mostly, though, it is other reds, greens, and golds I had in stash. I didn’t buy anything new for this. Quilt top, laid out on the floor. I can’t get quite high enough to fit the whole thing in view. It’s about 68″ square. OH, that’s not true. I did buy the green paisley in one of the strip borders. I’d used a different green, cut it and attached it, and simply wasn’t happy with it. This green has more light in it and has more interesting pattern. A decent view of the center block, which finished at 16″. The green border around it is 2″ wide, taking the segment to 20″ square. Notice how the strip border neither encloses the center block, nor expands it. It is neutral. The swirly line print does draw the eye, but does not direct the eye farther out. This suits, because the center block really is self-contained. With its round shape and circling flying geese, it wouldn’t work as well with something like spraying half-square triangles in the first border. The outside border is the red plaid at the top of the photo. It helps settle down the riot caused by the pile of packages in the next border, all in scrappy fabrics. I had fun making the green “packages” with their bows on top. The bows are just flying geese, and they echo the shapes in the hourglasses above, as well as the flying geese in the center and the pinwheels in the corner blocks. The pinwheel corner blocks are a funny illusion. They’re made of the same block as that ribbon border near the center. It’s called a “Y” block in EQ7. There are 4 of them in a pinwheel block, and using all the same “background” fabric makes it look like a pinwheel on point. The pinwheel spins, as do the flying geese in the center, though going in different directions. Finally, they are one more allusion to a package, as it looks like you’re looking down on the top of a fancy bow. Over the years I’ve gotten over the wish to make my fabrics match for style. While I do want them to “go” together, there is a pretty broad range, even in a quilt like this. There are 1800s reproductions, a few Christmas fabrics, at least one batik, a fabric sold as wide backing fabric… I enjoyed using the last of a few scraps, evening piecing a few scraps together to make patches big enough. I remember where I bought some of these, including on a family reunion trip in Michigan, on an outing to Illinois with Jim, at chain stores and local quilt shops and one online store. A quilt like this represents a large part of my quilting history, stitching memories into the design. 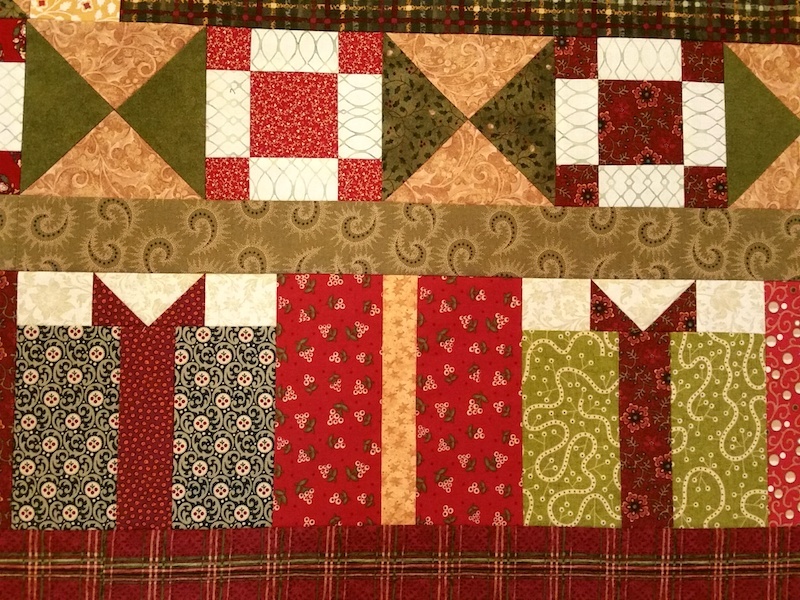 This entry was posted in Medallion Quilts, Quilting and tagged Borders, Christmas, Christmas quilt, Classes, Creativity, Design, Medallion quilts, Original design, Process, Progress, Stash, Work in process on November 2, 2017 by Melanie McNeil. One of the biggest stumbling blocks making medallion quilts is getting borders to fit. 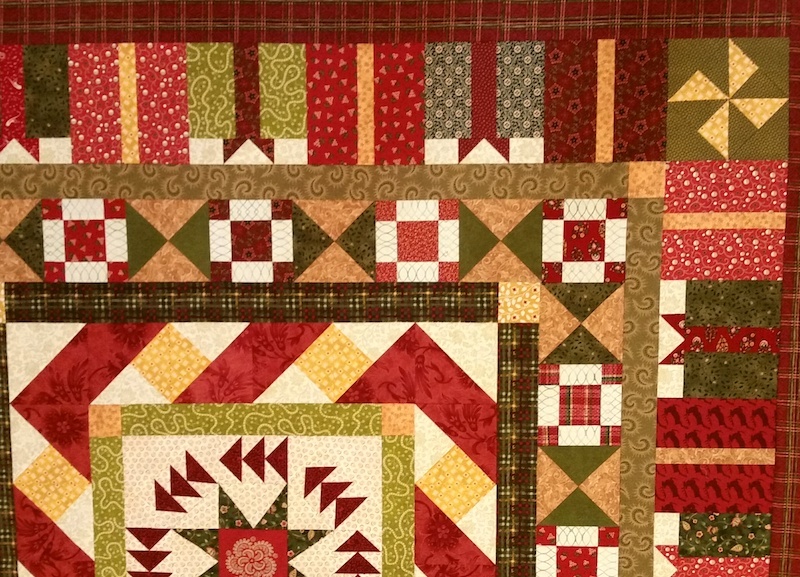 Pieced borders provide their own special challenges. But plenty of quilters, of any kind of quilt, have trouble with unpieced borders. When I started quilting, almost every block quilt or strip quilt had an unpieced border, or perhaps two. Books on quilting gave recommendations to make the width proportionally pleasing to the center of the top. Too wide and it would look like you’re trying to make the quilt bigger. Too narrow and it wouldn’t have enough visual impact. Quilt police chimed in with edicts to join lengths together at an angle, or with a perpendicular seam, depending on their own preferences. Patterns continually called for cutting border strips across the width of fabric. Most sources recommended measuring the quilt center in three places (the same direction) and averaging those three. Somehow, that would magically make your border fit. And occasionally I saw instructions to mark the center of the border strip, the center of the top, and perhaps at the quarters, and pin those marks. Usually it was recommended to pin every few inches in between. Whatever these instructions did, they did not, generally, make borders fit better. 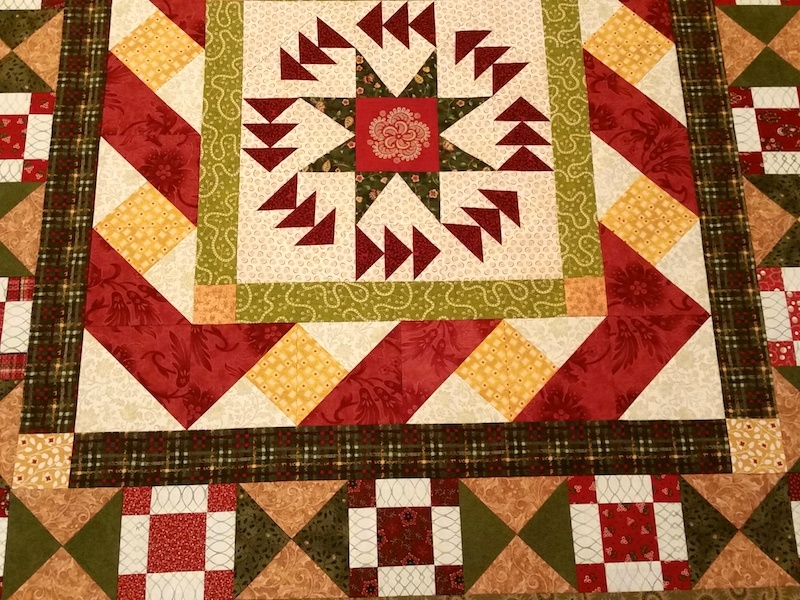 I’m in a longarm quilting group in Facebook, and badly fitting borders might be the number one complaint quilters have about their customers’ work. They share photos of the worst cases. Once a top is loaded on the frame, it’s easy to see the ripples and waves of excess border fabric. That will not quilt out! How does this happen? A lot of ways. The most common, I expect, is that people cut a long strip of fabric, probably across the grain, lay it on without measuring or pinning, and sew. As they sew, they smooth the border out, continuing to stretch it farther and farther as compared to the quilt piece below it. The feed dogs pull slightly more against that bottom layer, making the problem even worse. It’s almost like gathering a skirt by having more fabric on one layer than on another, and easing it in. Do you do this? I have!! What a mess! 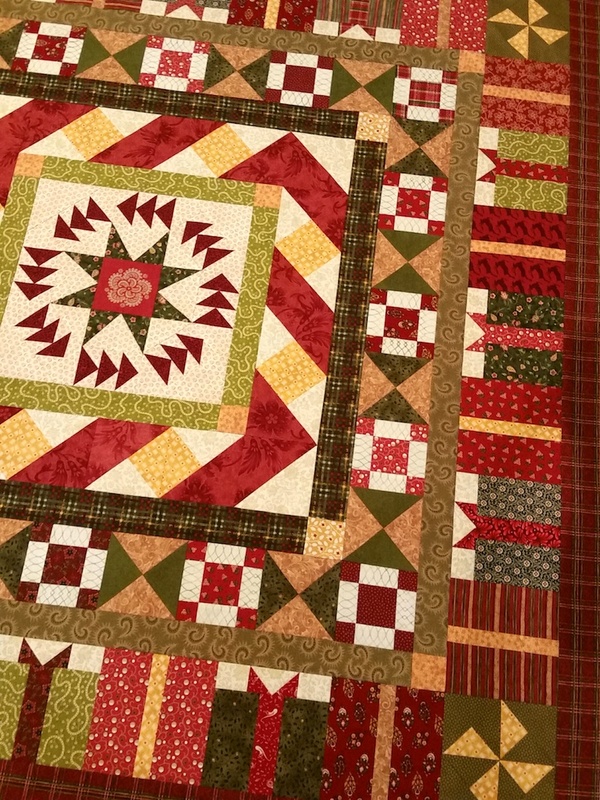 Medallion quilts often use unpieced strips in the interior, as well as outer borders. Rippling inner borders make it nearly impossible to correctly fit the next borders to them. You can sew it on, but the distortions will make a flat, squared top impossible. The flatter the top, the more easily it can be quilted and the better it will look finished. There are easy ways to make borders fit better. Here are a few tips. Square the center’s corners before attaching a border. Splayed corners will multiply if they aren’t fixed. (The “center” is everything that is already assembled into something that will be bordered. If you are adding multiple borders, each new border becomes part of the center once it is attached.) Use your largest square ruler to check the center’s corners. If the center’s edges don’t align to the square, you can either trim them to square, or adjust seam allowances perpendicular to the edge to improve the shape. OR if the problem is minor, attach the strip border and then trim it to square. Cut border lengths along the selvage if possible. The grain is more stable than on width-of-fabric, meaning you’ll get less stretch and distortion. If you need to join lengths, use a perpendicular seam. It is easier to align the pieces correctly this way. You won’t have a bias seam to stretch. And the seam is shorter than if joined on the diagonal, so any mismatch in the print extends for a smaller length. If you have corner blocks, they will be on the third and fourth strips of the border set. Begin your pinning by matching the seams of the corner blocks to the first and second strips of the border set. Continue to pin as above. Secure your long seams by backstitching at both ends. Use your walking foot (even-feed foot) if it helps keep the layers from shifting, giving a smoother seam. When I began quilting, I relied heavily on a few online sources of information (and back then, there were only a few!) One of them was Bonnie Hunter of Quiltville.com. (She still has great stuff on her site. Take a look around, especially at her Tips & Techniques.) Bonnie has a whole page just on border hints, and this is where I learned to cut and attach border strips. Some people take several measurements across the quilt and average that measurement for borders. (hear me gasping in fright here!) I *NEVER* “average” when measuring for borders because they can still flare, and where they are going to flare the worst is at the center of the quilt sides…That’s why the CENTER measurement is the one to go for. If the ‘averaged’ measurement is longer than the quilt CENTER measurement, you are GOING to have a flared border. If the ‘averaged’ measurement is smaller than quilt center measurement, you are going to have borders that are too tight for your quilt center, and the center of your quilt is going to balloon out. Just use the center measurement and your quilt will lie flat! How to get that centerline measurement? Should you hold the quilt top in your lap and move the measuring tape across it a few inches at a time? (Can you see my eyes rolling?!?) No. Lay the quilt top out flat, preferably on the floor. If you don’t have enough room to spread it out, you can bunch up or fold in the sides. But the center must be spread out flat in a straight line, without twisting. Smooth it out without stretching, just to flatten it to the floor. Cut two border strips for that direction and stack them on top of each other. Cut one end perpendicular to the length. Lay them across the center. Start with the cut end flush with the edge of the quilt top. Smooth the strips out so they are flat against the center. Don’t stretch them! Mark the other end of the top strip using a straight edge and pen or pencil. Cut the strips on the marked line. If you will have corner blocks, repeat with the other two strips in the other direction prior to sewing the first two strips on. If you won’t have corner blocks, sew the first two strips on, and then repeat. Cut along the selvage when possible. Smooth the quilt top out flat, and smooth the border strip across its center. See the border strip turned back a bit? Align the edge of the border strip to the edge of the quilt top. At the other end, mark the edge with a ruler and pen. Then cut the strip across the marked line. I’ve applied hundreds, maybe thousands of borders using this method. My quilt tops are almost always square and flat. Thanks to Bonnie Hunter for the lesson! 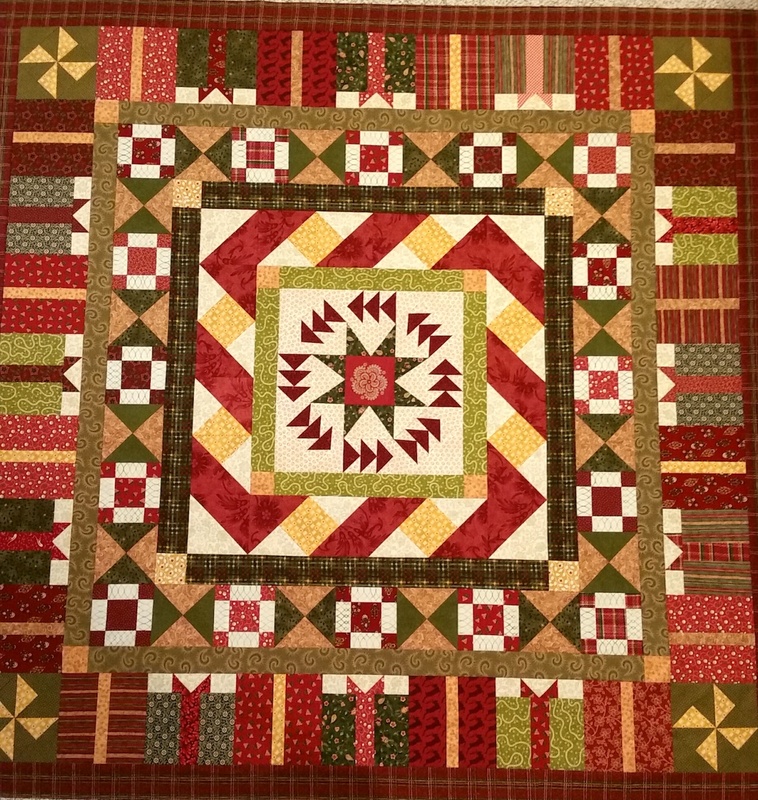 This entry was posted in Medallion Lessons, Medallion Quilts, Quilting and tagged Bonnie Hunter, Borders, Lessons, Medallion Lessons, Quilt borders, Tips, Tutorial on October 31, 2017 by Melanie McNeil. Some quilts decide to be made, regardless of our intentions. Such was the case for Black Sheep Manor. This is a quilt I would not have made, if not for seeing a panel print earlier this year at a local quilt shop. The full panel had 15 small panel motifs with a country estate theme. The faux-crackled, tea-stained background with black print featured a sheep, two manor houses, a squirrel, two trees, and other assorted illustrations. This is not my typical style. But Jim and I have friends, smart, funny, warm people, who’ve recently moved to a home they call their “Black Sheep Manor.” When I saw the black sheep on the panel, I had to get it. The quilt called to be made. 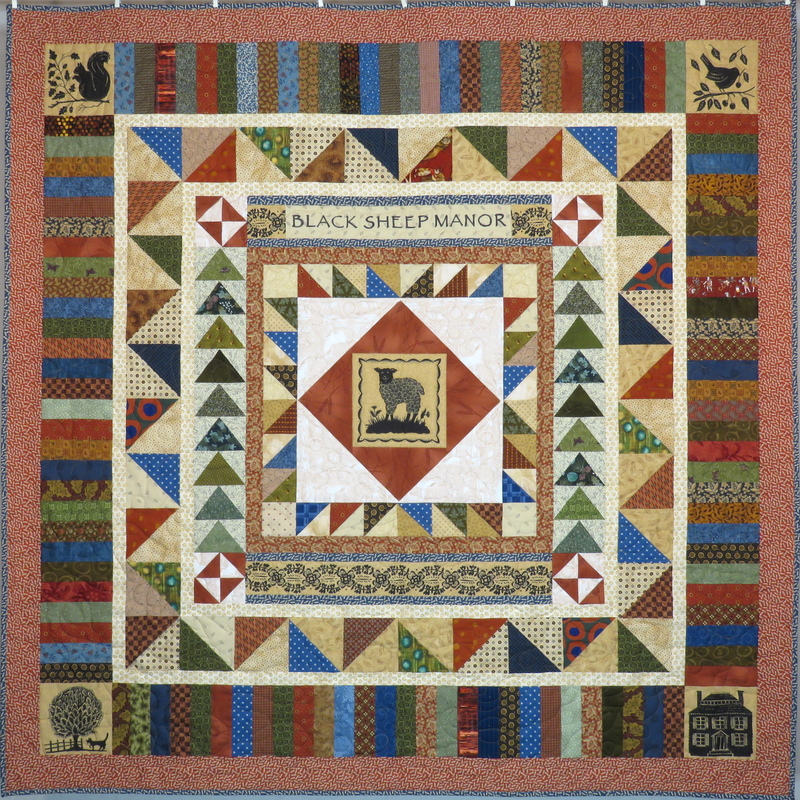 The black sheep had to center the quilt, but the small panel finishes at 7″. The size is better suited for a pillow or placemat than the focal point of a lap quilt. I’ve written before about enlarging center blocks with frames of various types. Adding variable star points doubles the size, and making a star-in-a-star quadruples it. But as much as I like stars, this little sheep called for something else. To highlight and enlarge the sheep without other distractions, I chose to set it with an economy block setting. The simplicity draws the eye to the middle. Using strong value contrast with the subtlety of tone-on-tone prints emphasizes the block structure, as well. The pattern design on the brick-colored fabric is of wheat stalks, and the pinky-tan setting triangles are printed with a deer motif. Both suit the small-farm life of our friends. 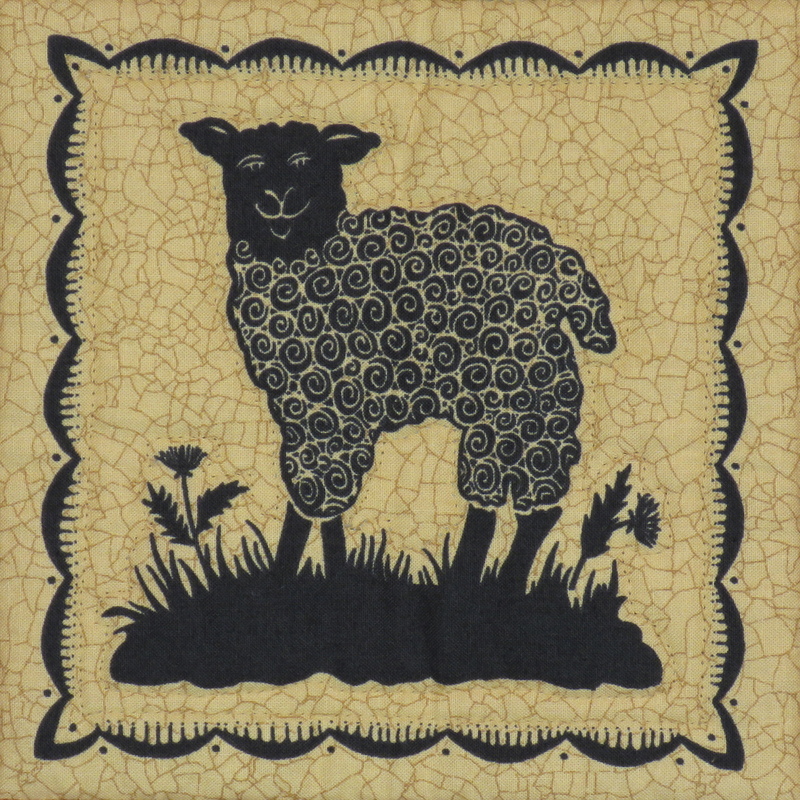 These two fabrics, along with the sheep panel, set the theme for the rest of the quilt. The darker rust print edge around the HST finished the look of the center. Rather than the center appearing as a 7″ square, it is 22.5″. Outside of the narrow rust strip is the second most important piece of the quilt. Though the sheep literally plays center stage, the wording personalizes it. 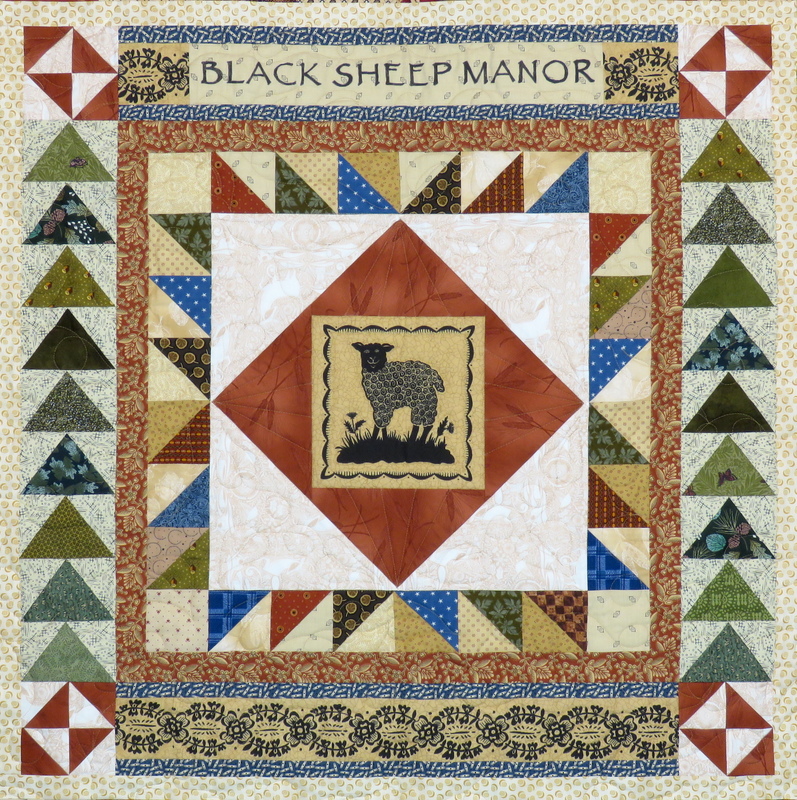 Anyone could like black sheep, but there is only one Black Sheep Manor. The wording is hand-lettered using fabric markers. I printed the words on paper and then arranged a light box with an overturned plastic tub on top of a CFL utility light. I taped the paper to the plastic tub. Freezer paper on the back of the fabric stabilized it, and I taped that down, as well. I outlined the letters with a very fine-tipped pen, and then filled them in with a heavier marker. Framing the wording on either end, and below the sheep block, are strips from the width-of-fabric panel print. On the left and right borders are paper-pieced triangles that finish 2.5″ x 3.75″. 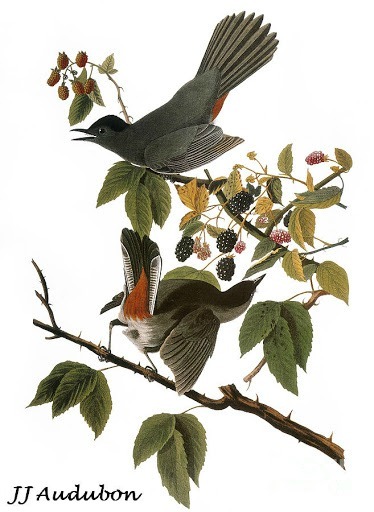 They are proportioned differently than flying geese, which lets them fit the space evenly as well as suggest pine trees. The corner blocks are of the broken dishes format. Black Sheep Manor. Approx 58″ x 58″. September 2017. Photo by Jim Ruebush. The next pieced border is of larger HSTs. The HSTs repeats the shapes of the inner border, but the shifting orientation keeps them from simple repetition. It also prevents them from making a dark line on either side of the border, so it is more open and airy. Also note the narrow strip borders on either side of the HST. These are one of the lightest values in the whole quilt. Using the light color is a bit unexpected, and it keeps the quilt from descending into dinginess. The next border is a style called “piano keys.” I cut the piano keys border to finish at 6″ and planned to make shoofly corner blocks. Instead, I chose four of the other small panel pieces and cornered the border with them. Once their decorative “frame” was trimmed off, they finished at 5.25″, so I trimmed the piano keys to match. Aside from the corner blocks, the piano keys border is mostly dark in value. The piano keys are made with 28 strips on each side. I made the strips into blocks of four strips each. Each block has a red, a brown (or black,) a blue, and a green strip. These are two warm and two cool. I assembled the blocks in haphazard order, and then assembled the borders only making sure that no two strips of the same color touched each other. Aside from very minimal rearrangement, the placement is random, but the colors and “temperatures” are well-distributed. This was easy! And more importantly, it is not formal or regimented, but casual. The last border of another rusty print frames the whole. I didn’t know what width I wanted until I tried it. No elements of the quilt are very large, so a relatively narrow border worked better for proportions. Almost all of my quilts have at least one scrappy border. They help to integrate the multiple pieces of similar color that I use within a quilt. 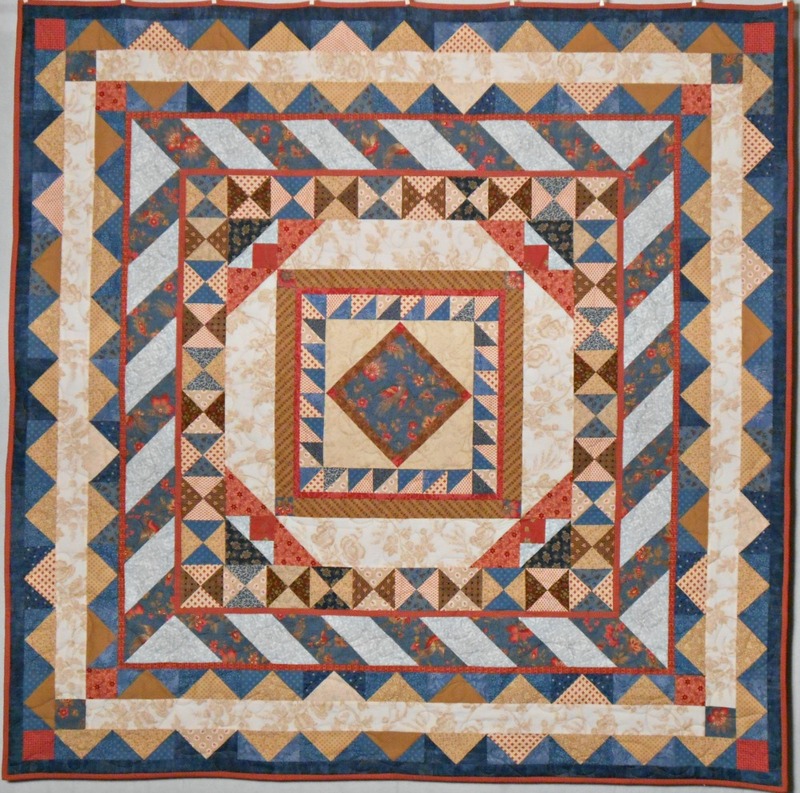 This quilt differs by being scrappy throughout, giving it a casual and homey feel. Even with scraps, the look is consistent. All the colors have a golden tinge. The reds are brick red and rust; the greens are olivey; the blues all have a touch of teal; and the browns and blacks are warm, not cool. The tan or “background” fabrics also tend toward golden, not grey. However, if you look more closely at the fabrics, you’ll notice I didn’t take the fabric patterns too seriously. They range from 1800s reproductions to a small piece of a circus print, to Kaffe Fassett. The color and value were far more important than the style of print. To keep the dozens of fabrics from leading the quilt into chaos, there are places without scraps. For example, the center block has only three fabrics: the black sheep panel, the inner brick red triangles, and the outer tan triangles. The brick red and tan are repeated with the same fabrics for the broken dishes corner blocks. The inner strip border and the final border echo the brick red, varying it somewhat toward rust. The two pale strips borders use the same fabrics. The panel corner blocks with the piano keys emphasize the sheep by repeating the same fabric style. All these points of repetition help calm the appearance. Except for the panel (which demanded I buy it and make a quilt with it,) all of the fabrics are from my stash, including the back. The vast majority is from scraps and small pieces. Very little is from yardage. It’s been a very long time since I worked with mostly scraps and I enjoyed it a lot. I had a hard time deciding how to quilt this. I didn’t want the stitching to run rampant over the little sheep, but I also didn’t want to custom quilt the entire piece. I compromised by quilting the center very simply, with an outline of the sheep, a simple fan pattern on the brick red, and triangles of leaves and loops on the tan. For the rest of the quilt, I did an all-over leaves and loops design. I really fell in love with this quilt. As noted at the top, this is not my typical style, with the black-and-tan-and-country feel. But I often think my very best quilts are those I make for specific people, and I think this is one of them. Another reason I love it is because I couldn’t have made it before now. The design shows a level of expertise that I’ve developed over time. The paper piecing is a new technique for me this year. Hand-lettering the banner isn’t something I would have tried until recently. Besides the look, I enjoyed the process. The ease with which it went together is rare. Each step of the way, decisions were simple, but from a strong sense of direction, not merely from habit. My friends received the quilt and are thrilled. They’re happy, and that makes me happy. 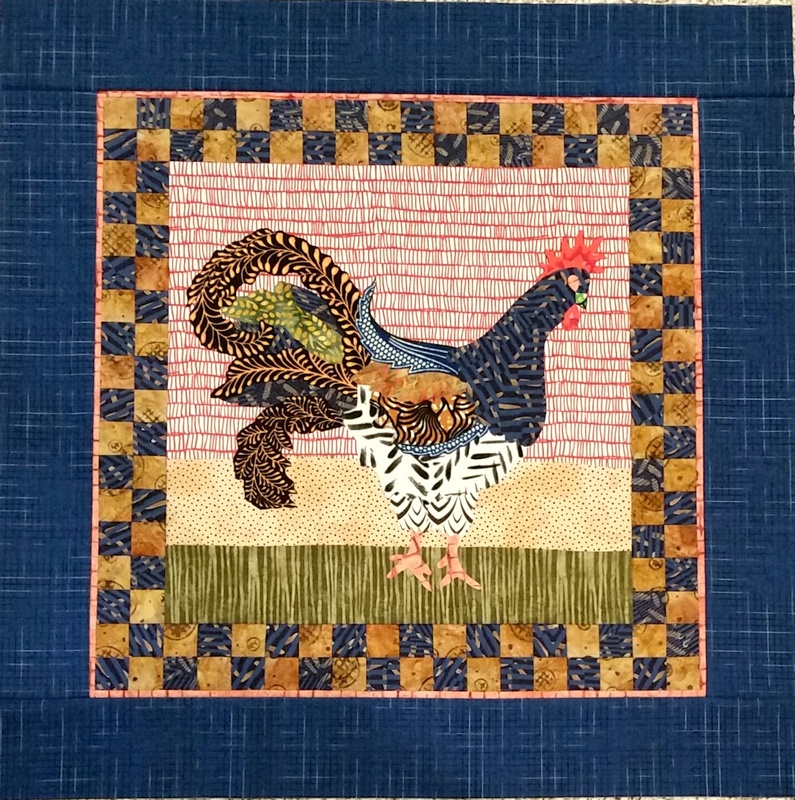 This entry was posted in Medallion Lessons, Medallion Quilts, Quilting and tagged Borders, Friends, Friendship, Medallion quilts, Original design, Paper piecing, Process, Stash on October 9, 2017 by Melanie McNeil.